Kid Time: Say "Cheese Brick!" The click of these particular LEGOS will be a camera click. Lego is planning on releasing digital and video cameras this summer for $19.99 to $59.99 according to KidsTechReview. The cameras won't actually be made of LEGOs, but hopefully they will be able to take being dropped, stepped on, and chewed by the family dog like the originals. 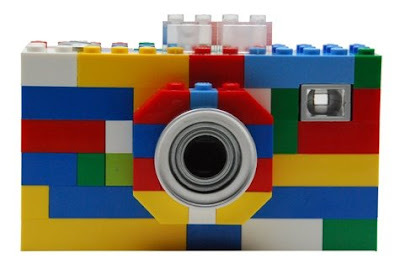 As cool as a LEGO camera will be, you could just buy a used digital camera for cheap on eBay, and for $20 get your child started with photography inexpensively. It may not last as long, but the kids will feel like a real photographer, with a real camera, just like Mom and Dad. Thanks to Geriann for the ebay tip!